1. From? Born in Finland but have lived in Sweden all my life. 2. There is always a cup of coffee on my table with all my brushes and palette knives. 3. I am a big fan of teal in any shades. Teal with brown to create a vintage feeling. 4. Favorites creations are often rusty and grungy. Like to mix rusty with a bit shabby feeling. I like contrast when I create. 5. 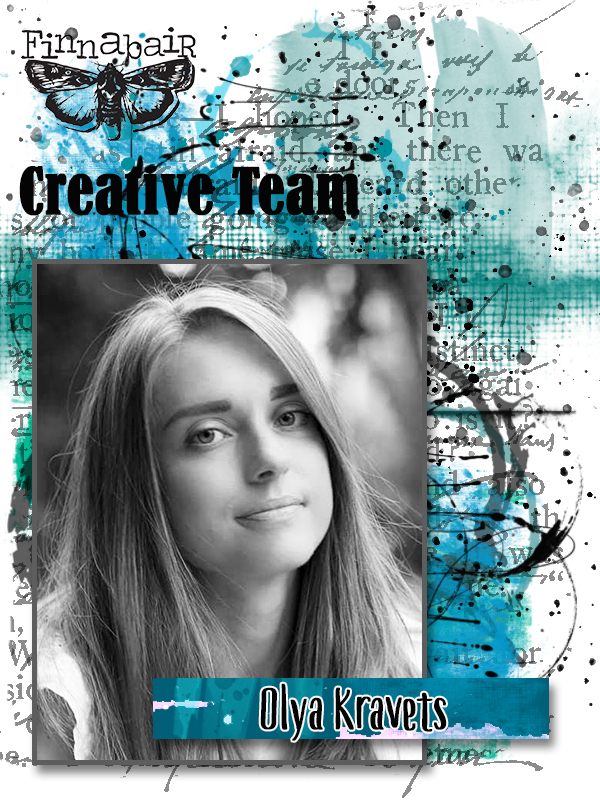 I am inspired by: There are so many to get inspiration from but always love Ola Khomenok and Kasia Bogatko's work. 6. When I see a blank page, I always want to create. My heads start to spin around with ideas. 7. Cats or dogs? I am a cat lover. 8. Tea or coffee? I drink several cups of coffee every day. Ok, I drink latte every day. Lot of milk to my coffee. 9. Simple or messy? I try to do both ways, it is a freedom when you create. But I think I am more simple than messy. 10. My dream is that my children will have a good and healthy life in the future. 2. Always on my work table: artistic mess, paints, pastes, sprays, as well as brushes, which I have too much. 3. Favorite color palette: violet, turquoise, brown, silver, pink, cream, green, navy blue, black, white (all in all I love all colors). 5. I am inspired by: everything around me, nature and shapes. I am free to create on my mood and feelings. 6. When I see a blank page/canvas: I try to create something special on it. 7. Cats or dogs? Cats. 8. Tea or coffee? Coffee. 9. Simple or messy? Definitely messy. Definatelly altered art. I love to take old treasures and repurpose them, give them another life. I'm also enchanted over assemblage art. But when I want to "relax" I play with canvases, small boxes, tags and art journal pages. My mind starts to brainstorming how I can take that canvas "out of the box". I love everything that is different, unusual, special, so I'm always excited over ideas that I feel take things to another level. Cats! I love cats! But I also love dogs! They are just perfect! Their love is so pure and unconditional! World of honest love. My family beeing happy and healthy. Having our own house with a big, spacious and bright art studio. 1. From? I’m basically from Gujarat state, India. And now we are here in the state Maharashtra, Thane. In between years I was in Singapore for 2 years. 3. Favorite color palette: Usually I don’t have any particular colour palette which I can say favourite because I do love all colours , but mostly I like tones of violets and gold. 4. Favorite creations: At the beginning of Mixed Media Journey I started making Altered projects, then I wanna try new things I go into layouts and now I’m in love with layout and canvas as well as altered art. 5. I am inspired by: By nature, emotions , Beauty as well as fact of life. I love to see both the sides of life . Bright as well as dark. Because it is easy to heal if we understand the facts of life and nature. 6. When I see a blank page/canvas: I make it messy with my creativity . I love to play on canvas specially. 10. I'm dreaming about: I’m still feeling that I’m in a dream to be in Finnabair team... but if you ask for a dream which I dreamed every day to meet Finnabair. 2.Always on my work table: Glass Media Mat, it is convenient to mix paints and texture pastes. 6. When I see a blank page / canvas: I already know what I will do with it! Four Artists will continue their Finn Team journey and I'm really grateful and excited to have them here with us. 1. From? I am originally from Assam, India but have been residing in Melbourne, Australia for 5 years now. 2. Always on my work table: gesso, art stones, gel medium, black thread and paint mediums. 3. Favorite color palette: teals, blue-violets, rusts and browns. 4. 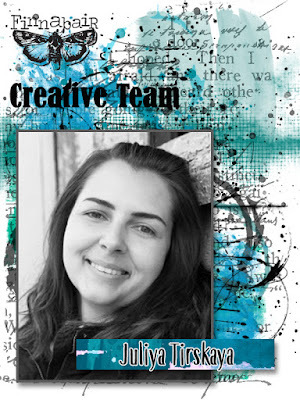 Favorite creations: art journals,dimensional canvases and altered art. 5. I am inspired by: everything Finnabair !! and vintage elements in antique warehouses and rustic places. 6. When I see a blank page/canvas: I approach the blank canvas in a unconscious free flowing way and have nothing specific pre-planned. I always tend to express my mind through an art-piece and in the end, the audience is in charge of interpreting what they see or feel towards the art. 7. Cats or dogs? Big furry dogs. 9. Simple or messy? messy messy messy! 1. From? I live in the north in the Republic of Sakha. I love our snowy town Yakutsk and friendly and kind people who live here. In Yakutia there is really beautiful nature: the Lena Pillars, the Bulus, the Lena River and I really love all these places and as often as possible I leave the city for our summer home. 3. Favorite color palette: I really like different shades of blue, purple and brown with green. 4. 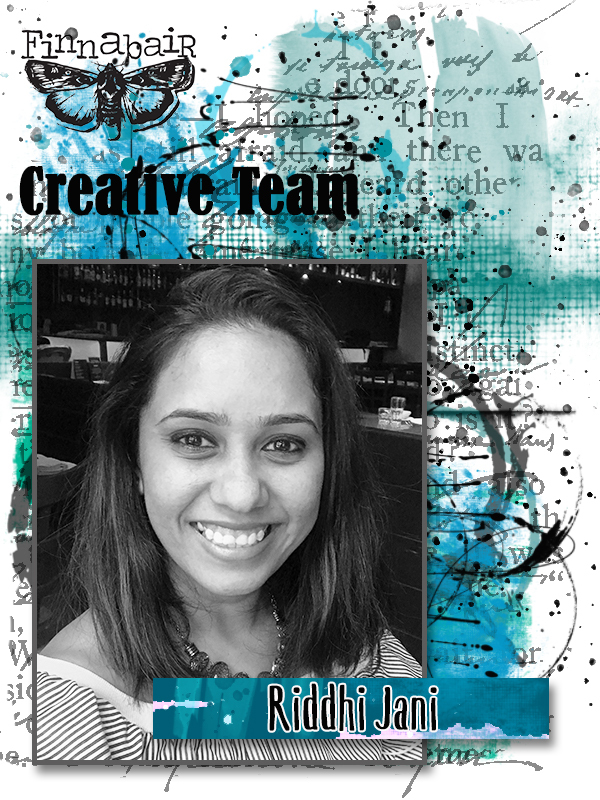 Favorite creations: I feel the most comfortable with layouts and canvases. But I like to leave this comfort zone and often try out new things for myself. 5. I am inspired by: Music, books, beautiful images in the movies or in photographs. Nature and people. 6. When I see a blank page/canvas: This is my favorite moment! When you look at beautiful paper or the texture of the canvas I like to think how to convey the mood, which method I can use and what kind of new material to try. 8. Tea or coffee? Tea. 9. Simple or messy? Messy. 10. I'm dreaming about: ﻿I dream about my own studio and having more space for my art and I believe that in time I will come true. 1. From? Ukraine, but now we live in Moscow with my family. 2. Always on my work table: mediums and gesso, paints, brushes, sprays and my baby girl when I create. 3. Favorite color palette: blue, violet and gold. 4. Favorite creations: I really like different creations, but most of all are canvases and an altered art. 5. I am inspired by: everything around me - nature, movies, books, feelings, emotions and new materials for creativity. 6. When I see a blank page/canvas: I challenge my possibilities and create a color and a new idea. 8. Tea or coffee? Coffee definitely. 10. I'm dreaming about: being myself, inspire people, create and be better every day. 6. When I see a blank page/canvas: I want to do something special and better than before. 7. Cats or dogs? Dogs! Marta Grochocka - visit her website here! 2. Always on my work table: sprays, fabric plaster, gesso, stencils. 4. Favorite creations: Oh, art journals of course! 5. I am inspired by: in no particular order: dreams, thoughts, feelings and emotions, books, music, nature, people, conversations, colors, shapes, textures. 6. When I see a blank page/canvas: I see a challenge. :) Or I quickly have a few ideas in my head how to fill it. 8. Tea or coffee? Tea with lemon & sugar to relax, coffee with milk & sugar to work. 10. I'm dreaming about: Going back to Scotland one day... Just to smell the air again. 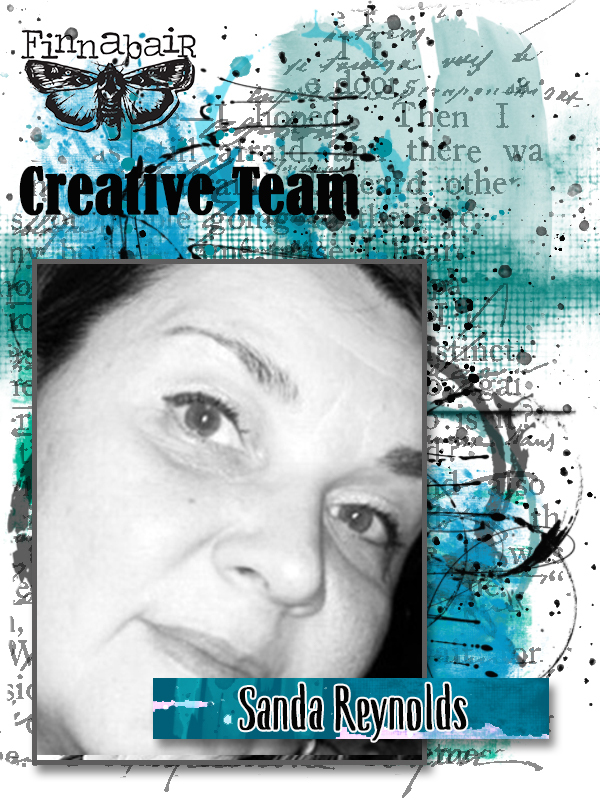 Sanda Reynolds - visit her website here! 1. From? I am from Romania, but I live in London UK with my Irish husband. 3. Favorite color palette: Love all colours, but teal, brown and gold is one of my favorite combos. 4. 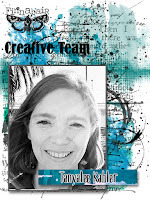 Favorite creations: Love collage, art journaling, assemblage, tags and cards. 5. I am inspired by: so many things... a walk in the park, sunshine, people, music, scraps of old laces and fabrics in a flea market, music, vintage photos, or just by the color of a jar of paint. 6. When I see a blank page/canvas: Can't wait to start working on it. 8. Tea or coffee? Mostly coffee, but love tea too. 9. Simple or messy? That's easy: terribly messy! 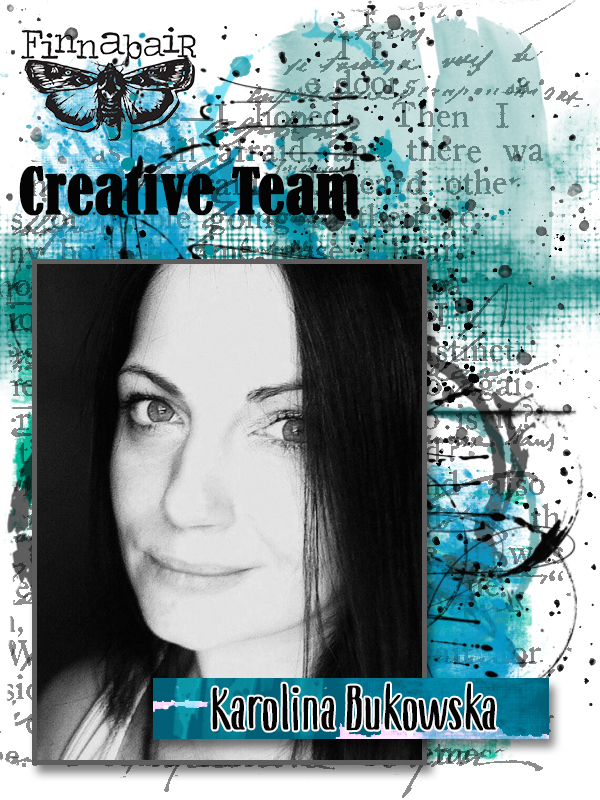 Karolina Bukowska - visit her website here! 2. Always on my work table: organised chaos - papers, glue, scissors, white gesso. 3. Favorite color palette: gold, brown, pink, turquoise, blue. 4. 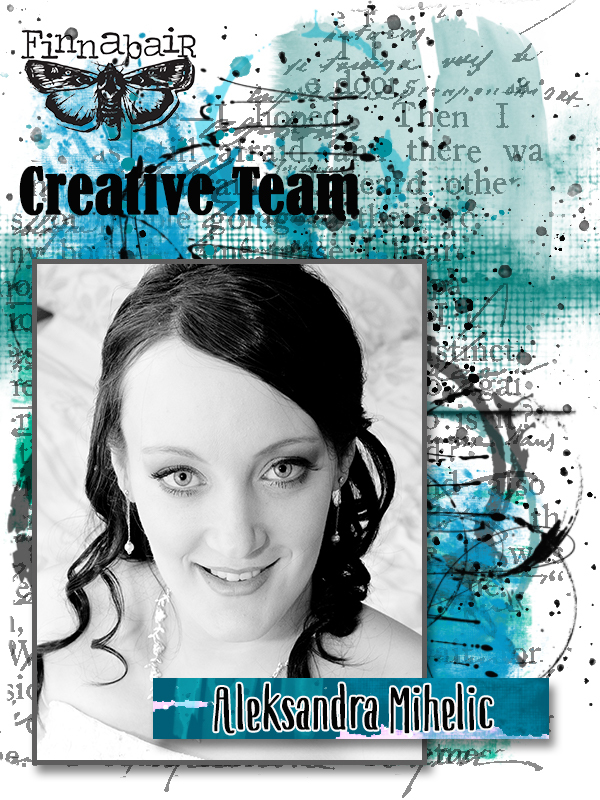 Favorite creations: altered art, canvases, scrapbooking layouts with a touch of mixed-media. 5. I am inspired by: life in general - nature, people, music, photography. 6. When I see a blank page/canvas: I see possibilities. 10. I'm dreaming about: Always being myself. 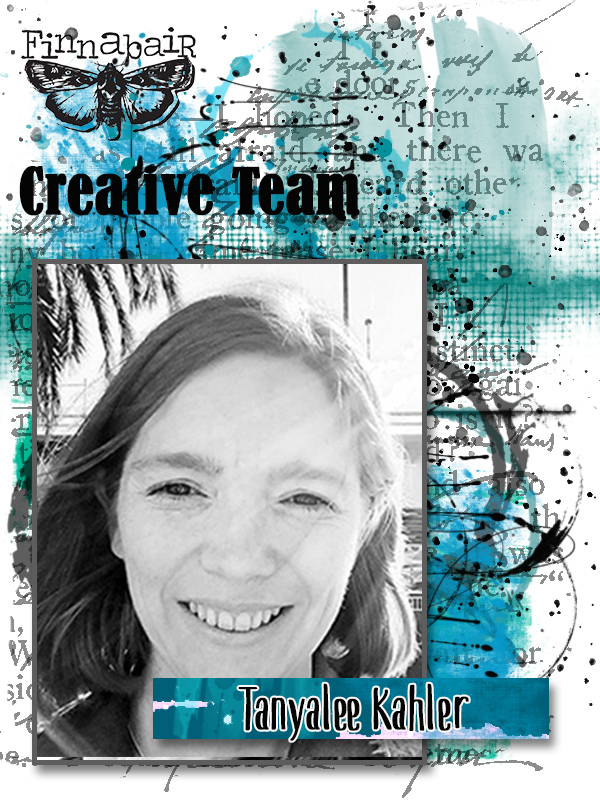 Tanyalee Kahler - visit her website here! 1. From? originally, Maryborough Queensland - now Hobart, Tasmania. 2. Always on my work table: A mess! There are always supplies, journals, paper, brushes, pens left out on my desk. And there are always paint splatters too. 3. Favorite color palette: Always pink, gold and black! 4. Favorite creations: My children of course! But art wise, I’m pretty proud of the magazine I produce - Brush Magazine, as well as some canvases I’ve created. 5. I am inspired by: so many things, but lately it’s words. I love creating art based on how a word makes me feel or what colours and shapes it evokes. 6. When I see a blank page/canvas: I swipe paint on it or glue down some paper. 7. Cats or dogs? Cats! I have three of them! 9. Simple or messy? Messy! 10. I'm dreaming about: longer days, spring flowers, warm weather and relaxation﻿. Kassa Hayselden - visit her website here! 2. Always on my work table: Colors! 3. Favorite color palette: A kaleidoscope of über brights. 9. Simple or messy? Messy - but call me crazy - my messy is a highly organised precision messy! I drive myself nuts! John Creighton Petersen - visit his website here! 1. From? I am a life long Seattle resident – love my trees, water and rain! 3. Favorite color palette: This changes constantly but my 'go to' color palette is always black, silver and sapphire. 4. Favorite creations: It seems that almost everything I work on ends up being some sort of mix of collage and assemblage. I’m constantly challenging myself to try something new, whether it be in creating a book, home decor piece or jewelry. 5. I am inspired by: EVERYTHING around me – the colors of the sky in a sunrise, the texture in a rusted piece of metal, song lyrics, architecture, other artists. 6. When I see a blank page/canvas: I become excited with the possibilities! 7. Cats or dogs? Dog – we are lucky to have Maddy in our life, a seven year old springer spaniel/boxer/pit mix who found us last year at the shelter. I can’t get enough of her puppy kisses and snoring at night. 8. Tea or coffee? Coffee, I’m from Seattle after all! Anyone who knows me can speak to my coffee obsession and knows that there is generally a cup of java nearby at most times. 9. Simple or messy? Controlled creative chaos, which is somewhere between simple and messy but not a hot mess. 10. 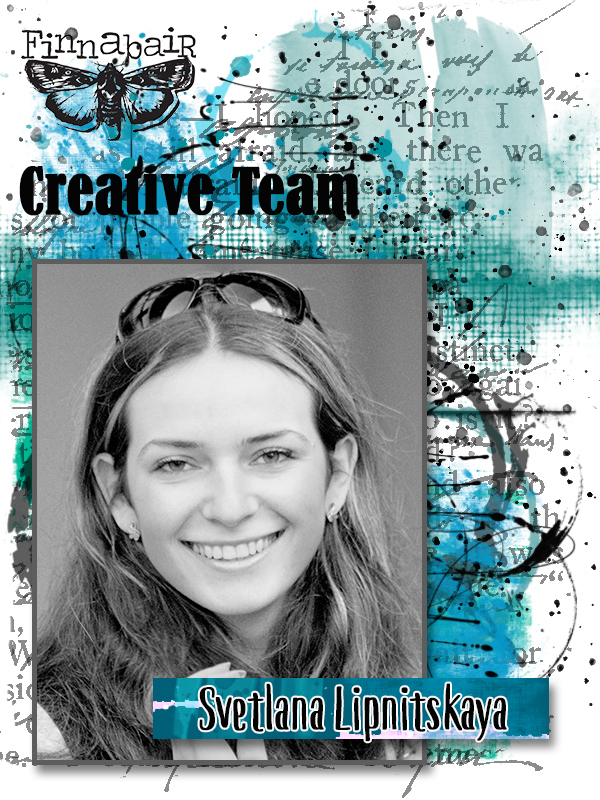 I’m dreaming about: My next creative project! I’m naturally curious so there is always something creative going on in my mind. Gayle Price - visit her website here! Athanasia Papantoniou - visit her website here! 6. When I see a blank page/canvas: there always comes a vision and I want to make it happen immediately! 7. Cats or dogs? How about a fish in a bowl? 8. Tea or coffee? Hot chocolate! 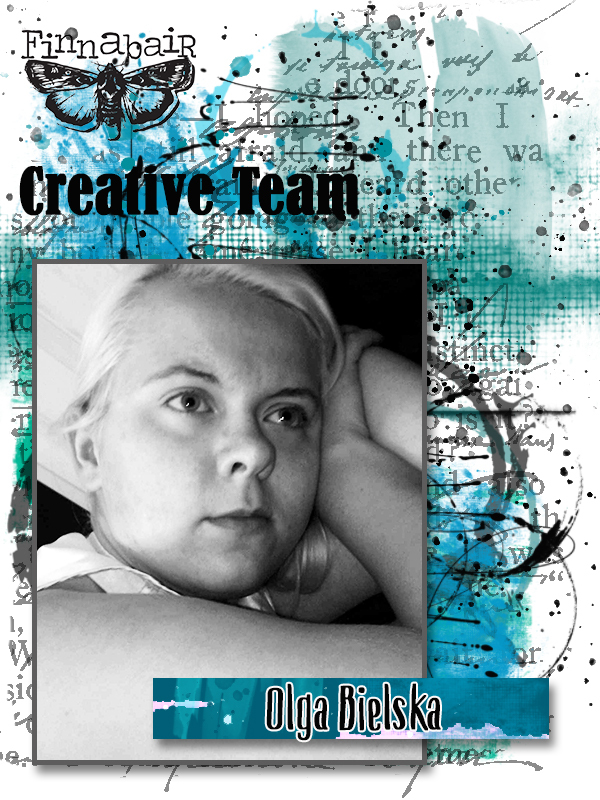 Olga Siedlecka - visit her website here! 7. Cats or dogs? May I choose dinosaurs? Linda M. Cain - visit her website here! 4. Favorite creations: probably tags and mixed media collages, but I love to do journal pages, too! 5. I'm inspired by: Finn of course, but Michael Jack Putman & Jen Crossley are two of my favorite creative Artists. 6. When I see a blank page/canvas: I want to add COLOR! 7. Cats or dogs? Neither - I'm allergic to both! 9. Simple or messy? I've always admired anyone that can do "simple" well. I just feel every speck of space "needs" something. But I wouldn't call it messy, I'd call it generously arranged composition. 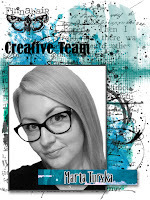 Marta Łapowska (Maremi) - visit her website here! 8. Tea or coffee? Definitely coffee. Denisa Gryczova - visit her website here! Irina Honcharyk - visit her website here! Carole AndCo - visit her website here! 7. Cats or dogs? Cats and dogs! 8. Tea or coffee? Tea addict! 10. 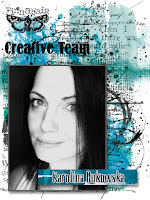 I'm dreaming about: creating all day! Elena Smoktunova - visit her website here! 6. When I see a blank page/canvas: I want to make it come alive, three-dimensional and beautiful. I love creating beauty! 7. Cats or dogs? Cats! Riikka Kovasin - visit her website here! 2. Always on my work table: craft mat, but gesso & stamp ain't far either! 6. When I see a blank page/canvas: I want to start creating! 8. Tea or coffee? Tea, please. With milk. 9. Simple or messy? Definitely messy! The more color on my fingers, the better! 10. I'm dreaming about: finding more hours to the day! Monika (Kolorowy Ptak) - visit her website here! 8. Tea or coffee? Coffee! 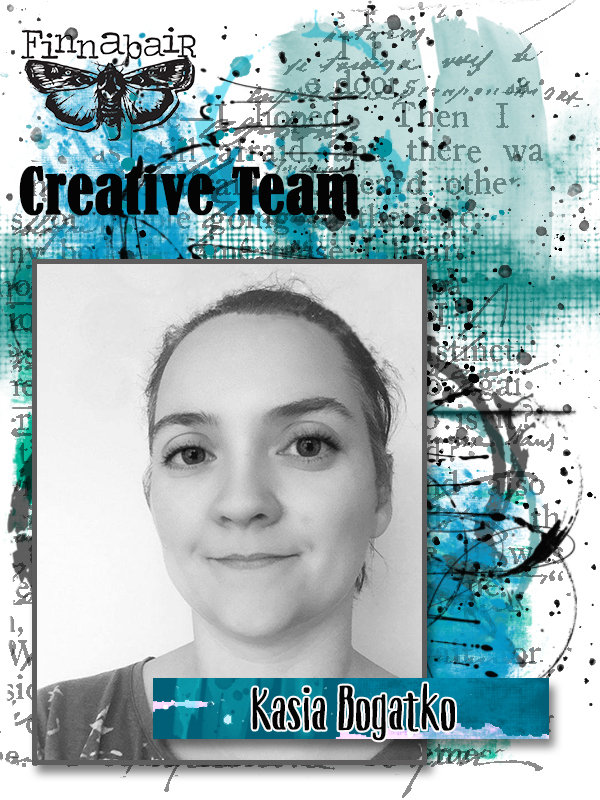 Rebecca Morris - visit her website here! Lena Morgun - visit her website here! 4. Favorite creations: big scrapbooking albums! 6. When I see a blank page/canvas: I turn on the music, take out my favorite paints, some gesso and get going! Dear Finn, incidentally my name is Firnley, so we sort of clique sound wise. I am an avid admirer of your work, but must confess mostly your earlier work. You have inspired me and my students at school to great heights. I am male, but really, everything in your art circle revolves around women. Is it just me or is it true. I cannot believe that USA males cannot find the courage to tackle mix media steam punk art? I am South African and Black and over 40 and took to your lessons and art with a decidedly African, poor country solutions to most of your materials and techniques. For example, for brown I use leather dye and it gives the greatest colour for the work Ive ever seen. I cannot afford all your products and had to improvise most of it. Keep up the good work and please showcase some work by males as well. We are, I believe up to the task. Regards and thanks for adding wealth to my life.